Servicing restaurants, hotels, motels, hospitals, assisted living, long term care, and educational, institutional, and health care food service operations. 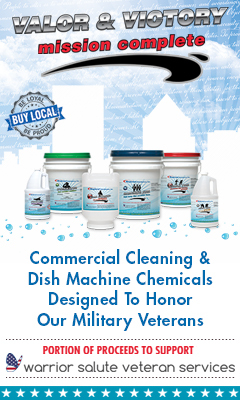 Regional Distributors, Inc. is one of Western New York's leading distributors of commercial warewashing machines and warewashing chemicals. We are one of the only distributors in the area that is an approved distributor of MEIKO USA's high-performance warewashing and disinfection systems. MEIKO USA is a leading manufacturer well-known within the food service industry for developing advanced dish machines that are ENERGY STAR® qualified, durable, conserve utilities, and are designed to improve overall warewashing and disinfection results. Regional Distributors, Inc. has installed MEIKO USA dish machines at some of Rochester's toughest warewashing businesses including Rochester Institute of Technology, Oak Hill Country Club, and Dinosaur Bar-B-Que. In addition to MEIKO USA, we're also proud to deliver high performance high and low temp machines from American Dish Service (ADS), flexible conveyor solutions from Gates Manufacturing, utility-conserving waste disposal systems from Salvajor, and world-class warewashing chemicals from U S Chemical. Our customers come to us for more than just machines. We are experts in all things warewashing and help our customers design the most optimal and efficient warewashing program to meet their specific space needs and food service operational goals. Installation and service of warewashing machines purchased through Regional Distributors, Inc. is available to our customers by one of our professional Service Technicians. Our service professionals provide personalized equipment training and dependable preventative maintenance and repair to ensure your warewashing machines continue working as hard as you do. Current Customers: If you require installation, service, or repair of your dish machine, contact our expert Service Team at (585) 647-5485 during normal business hours or after hours for emergency service. Regional Distributors, Inc. is a proud Affiliate Member of the Commercial Food Equipment Service Association (CFESA). Our membership demonstrates our higher level of knowledge, expertise, and craftsmanship when servicing food service equipment. We are part of a network of nearly 3,000 Certified Technicians throughout North and South America who are dedicated to anticipating trends and providing resources, training, and education to support excellence in service. You can count on our Certified CFESA Technicians, who deliver a higher first time fix rate, to keep your kitchen up and running. Take advantage of the financial flexibility of lease-financing. Our tax-deductible lease-financing plans provide you all of the benefits of warewashing, food service, and janitorial equipment ownership without the high upfront costs allowing you to purchase the time- and cost-saving equipment you need today to help your business. Learn more about lease-financing your warewashing equipment. Order online or contact us to schedule a free on-site assessment. From an operational standpoint, dishwashers are one of the most expensive pieces of equipment in your commercial kitchen. Energy efficiency is a sound business practice that improves profitability, reduces greenhouse gas emissions, and conserves natural resources. Choosing ENERGY STAR qualified equipment helps you save energy and water, and boosts your bottom line while helping to protect the environment. Commercial dishwashers that have earned the ENERGY STAR are on average 25 percent more energy and water efficient than standard models. Qualified models must meet maximum water consumption requirements during the final rinse, utilize heat recovery and dish load sensors, and use less energy while idling between wash cycles. <-- Depending upon the commercial dishwasher you select, you could save an average of $1,300 - $4,100 annually on utility costs. In addition, you could save an average of 52,000 gallons of water per year, which on average translates to more than $200 per year savings on your water bills. 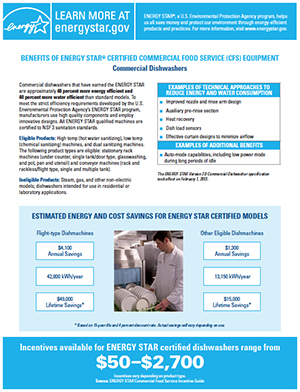 Learn more about ENERGY STAR qualified commercial dishwashers. Run fully loaded dish racks through the dish machine. Cutting wash cycles could save you hundreds of dollars annually. Pay attention to your dishwasher’s pressure gauge—if it’s showing pressure above 25 psi, there is a good chance you are using much more water than is necessary. Most dishwashers require only around 20 psi. If you have a conveyor-style dishwasher, make sure you are using it in auto mode, which saves electricity by running the conveyor motor only when needed. Replace torn wash curtains and worn spray heads. Ask about our lease-financing plans. 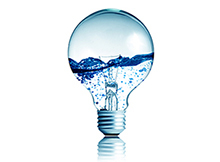 7 Ways to Save Energy and Water in Your Restaurant. Restaurants use significant amounts of energy and water throughout an entire operation - from the back kitchen to the restrooms. As energy and water costs increase, investing in energy and water efficient practices and equipment are the best ways to protect your business against these rising prices.